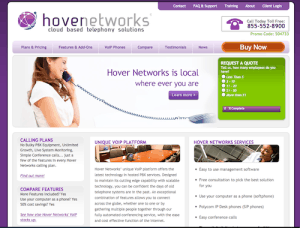 Hover Networks uses cloud technology and managed solutions to replace your outdated PBX systems. Talk one on one or create instant conference calls automatically through their fully automated conferencing service. Advanced features allow you to for example monitor all incoming calls, make it possible to send and receive paperless faxes, and let you queue calls to increase efficiency. Hover Networks’ services and pricing plans are geared towards businesses of all kinds, with the option to request a custom quote specifically for your company. 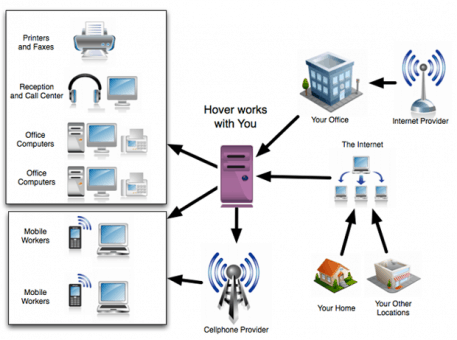 Hover Networks hosted PBX systems scale to fit your needs, are cheaper per employee, and are with you wherever you go. Take your computer with you and still have access to all the features you’d have while sitting in your office. Use your email account to send a fax. Get your voicemails transcribed and sent to your email. Generate detailed reports and manage your system in real time using your web-based interface. And if something goes wrong, talk to a real, live person who knows how to get you back on track. All this and much more is included standard in every plan. Who is This Virtual Phone System For? Any business can benefit from the features of using VoIP phones with hosted PBX services. All employees can make calls to anywhere in the world, from wherever they happen to be. Every feature is always available everywhere, just as it would be in the office. Hosted PBX solutions eliminate the need for unnecessary phone lines, including mobile phones, while adding feature rich services that simply aren’t available the old fashioned way. All three pricing plans include unlimited calling and faxing, and include a free phone with a two year contract. Standard features include high definition voice, name recognition, conference calling, Hover Networks Total Control (real time management of your hosted PBX system), plus too many other features to name here. Pick the plan that best fits the size of your business. Hover SoHo is for small offices and home offices of 1-3 people. It includes the full feature set, free installation, and you can try it out for thirty days for free. Hover Office is for small to medium sized businesses with four to nine employees. The full feature set, free installation and a thirty-day trial period at no cost is included as well. Hover Enterprise is the perfect solution for businesses with more than twenty employees. It includes all the standard features at a much-reduced price. Since installations of this size can vary greatly, you should call for a consultation to find out how much you can save. Hover Networks’ customer service squad is always ready to help with whatever issue you might have. Twenty four hours a day, seven days a week, there is a live human engineer who does speak your language, waiting to answer your call.